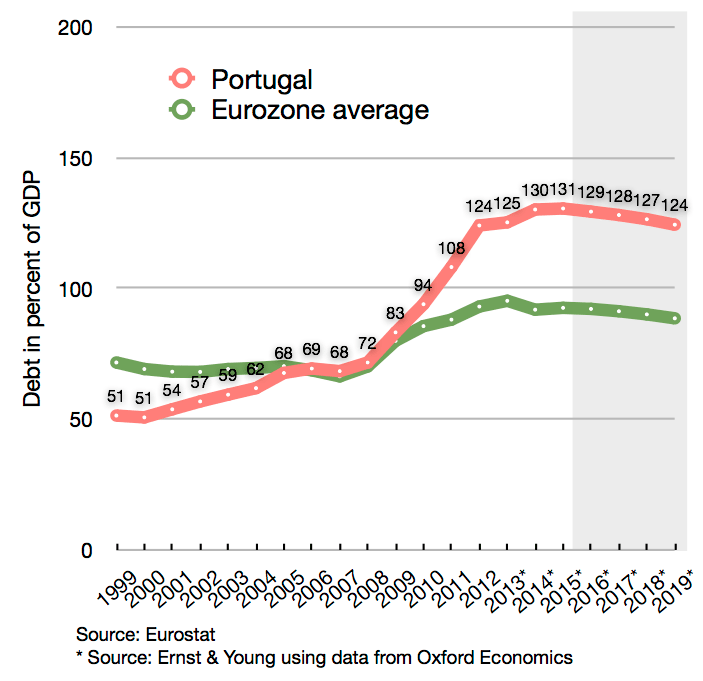 “In the euro area, the countries in the periphery have nothing at all to offset austerity. They are simply being asked to cut total spending without any form of demand to compensate. I think that is a serious problem. “I never imagined that we would ever again in an industrialised country have a depression deeper than the United States experienced in the 1930s and that’s what’s happened in Greece. On 13th July , the democratic elected Greek government of Alexis Tsipras was brought to its knees by the European Union. The “agreement” of 13th of July is in fact a coup d’état. It was obtained by having the European Central Bank close down the Greek banks and threaten never to allow them to open up again, until the Greek government accepted a new version of a failed program. Why? Because official Europe could not stand the idea that a people suffering from its self-defeating austerity program dared elect a government determined to say “No!”. So begins the call for “A plan B in Europe” put together by a group of prominent European left-leaning politicians from Parti de Gauche (France), Die Linke (Germany), Red Green Alliance (Denmark), Socialist Party (SP) (Ireland), Bloco de Esquerda (Portugal), and Syriza (Greece). Top of the bill is Yanis Varoufakis (a principle author, I imagine, given some of the polemical flourishes within this signed but otherwise uncredited page-long call to action). Now let us go back nine months – back to the eve of the Greek referendum during the dog days of last summer, and just before the extraordinary ‘oxi’ vote which momentarily reverberated across our western hemisphere. Yanis Varoufakis [3:45 mins in]: Let me tell you something which is probably unknown. Ever since we declared the referendum and we incensed our European partners we had the most interesting proposals coming from Brussels. Perhaps this referendum and the impasse it represents concentrated several minds in Brussels and we’ve had some really good proposals – proposals we would sign on the dotted line for. Paul Mason: You have a proposal you would sign on the dotted line for? Varoufakis: Well, I’m not going to tell you. It’s somewhere in this building. But the crucial part of the story is that before this proposal becomes a genuine negotiating document which we can sign off on Monday, the people have to empower us with a “no”. From the Channel 4 news interview embedded above broadcast on July 3rd 2015 that is also available here. You can find the same clip here on Varoufakis’ blog. Shortly thereafter [July 5th] the people of Greece, perhaps in light of Varoufakis’ advice, went to the polls and voted overwhelming in favour of rejecting the Eurogroup deal with its demands for increasing doses of “austerity” and ‘Washington Consensus’-style ‘conditionalities’ — the enforced privatisation of public services and other forms of so-called ‘deregulation’. To which the response from Brussels was to immediately double down by issuing still harsher neoliberal demands. With this, the mask of European social democracy fell away completely. This Eurogroup list of demands is madness. The trending hashtag #ThisIsACoup is exactly right. This goes beyond harsh into pure vindictiveness, complete destruction of national sovereignty, and no hope of relief. It is, presumably, meant to be an offer Greece can’t accept; but even so, it’s a grotesque betrayal of everything the European project was supposed to stand for. The people of Greece have resisted every threat, every piece of establishment propaganda telling them a No vote would mean ruin, and asserted their democratic rights. This will be a No heard around the world. Now is the time to celebrate – and to step up our solidarity ahead of the Troika’s next move. 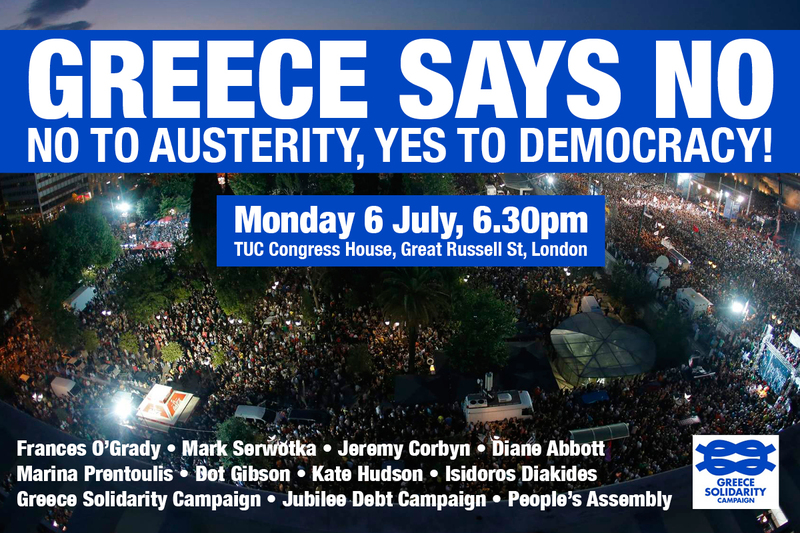 Come along to what will now be a victory rally at the TUC’s Congress House, organised by Greece Solidarity Campaign. And the Greeks had indeed empowered their government with a resounding ‘no’, but instead of fighting on, Syriza under Tsipras’ leadership swiftly capitulated in what must be one of the fastest political U-turns of all time. In response, Varoufakis resigned, refusing to criticise his friend Tsipras, and also declining an invitation to join a small breakaway faction who hoped to restore the party’s anti-austerity ticket on which Tsipras and Syriza had stood little more than six months previously. So there is a mystery here that remains. Varoufakis, who prides himself on openness, has simply never explained what actually happened during those most momentous days in early July. Specifically, what became of that proposal from Brussels he was so keen “to sign on the dotted line”. Surely he owes the Greek people a fuller explanation. Moreover, while Varoufakis was quick to attribute blame for the Eurogroup failures on the inflexibility of Wolfgang Schäuble and fellow German Karl Lamers, he has to a large extent absolved other key players including, most notably, President of the ECB, Mario Draghi for their part in “the coup” (his words). I have consistently defended Varoufakis and Tsipras and been scathing of others on the left for being too hurried in passing judgement and unduly hypercritical (as many earlier posts testify). Caught up in the drama, like others hoping Syriza’s election signified the beginning of truly revolutionary reforms, I confess that I became a cheerleader for both. Throughout the crisis, he and the party he once represented at the Eurogroup meetings have been chewed up and spat out time and again and yet his response has been to remain unruffled and reasonable in his continued fight (hardly the right word) “to save European capitalism from itself”. Today Varoufakis leads a parallel campaign Democracy In Europe 2025 made up of lecture tours and larger academic-style conferences making speculative calls for a Plan B in Europe. Beyond the well-meaning rhetoric, the movement is entirely bereft of strategy. And my immediate question to Varoufakis is actually this: why must we wait until 2025 to bring democracy (a gift of the ancient Greeks) back to Europe? After all he knows better than most that a week in politics is an exceedingly long time – so a decade might as well be an aeon. The vast majority of Greeks, who voted for Syriza, expected some immediate relief and reforms. They are increasingly disenchanted. They did not expect Tsipras to appoint Yanis Varoufakis, a former economic adviser to the corrupt neo-liberal PASOK leader George Papandreou, as Finance Minister. Nor did many voters abandon PASOK, en masse, over the past five years, only to find the same kleptocrats and unscrupulous opportunists occupying top positions in Syriza, thanks to Alexis Tsipras index finger. Nor could the electorate expect any fight, resistance and willingness to break with the Troika from Tsipras’ appointments of ex-pat Anglo-Greek professors. These armchair leftists (‘Marxist seminarians’) neither engaged in mass struggles nor suffered the consequences of the prolonged depression. Syriza is a party led by affluent upwardly mobile professionals, academics and intellectuals. They rule over (but in the name of) the impoverished working and salaried lower middle class, but in the interests of the Greek, and especially, German bankers. Click here to read the full article by James Petras. By latest estimates total Greek debt is 384 billion euros, or US$440 billion. That’s approaching nearly twice the size of Greece’s annual GDP. A decade ago, in 2007-08 before the global crash, Greek debt was roughly half of what it is today, in terms of both total debt and as a percent of GDP. 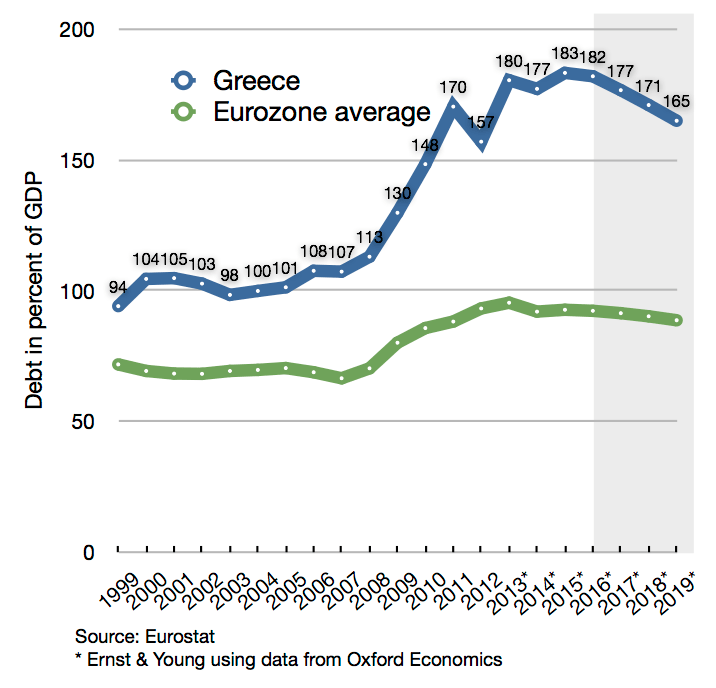 Greek debt was actually less than a number of Eurozone economies. So Greece’s debt has been primarily caused by the 2008-09 crash, Greece’s six year long economic depression [that] followed, the extreme austerity measures imposed on it by the Troika during this period which has been the primary cause of its long depression, and the Troika’s piling of debt on Greece to repay previously owed debt. Click here to read Jack Rasmus’ full article published in Counterpunch. The cycles of debt-repayment might literally be never-ending, because Greece will never be able to fully repay all of its (odious) debts. It is a situation compounded because Greece’s already floundering economy is completely suffocated by the Troika’s imposed “austerity” regime. But this disastrous situation is no accident. The trap in which Greece finds itself satisfies two neo-liberal objectives. Firstly, Greece becomes so impoverished that it is forced to sell state assets at rock-bottom prices. Secondly, the sustained wealth transfer from the pockets of the ordinary Greeks into the hands of the bankers helps to prop up a failed financial system. Having successfully used the EU to conquer the Greek people by turning the Greek “leftwing” government into a pawn of Germany’s banks, Germany now finds the IMF in the way of its plan to loot Greece into oblivion. The IMF’s rules prevent the organization from lending to countries that cannot repay the loan. The IMF has concluded on the basis of facts and analysis that Greece cannot repay. Therefore, the IMF is unwilling to lend Greece the money with which to repay the private banks. The IMF says that Greece’s creditors, many of whom are not creditors but simply bought up Greek debt at a cheap price in hopes of profiting, must write off some of the Greek debt in order to lower the debt to an amount that the Greek economy can service. The way Germany sees it, the IMF is supposed to lend Greece the money with which to repay the private German banks. Then the IMF is to be repaid by forcing Greece to reduce or abolish old age pensions, reduce public services and employment, and use the revenues saved to repay the IMF. In other words, Greece is being destroyed by the EU that it so foolishly joined and trusted. The same thing is happening to Portugal and is also underway in Spain and Italy. The looting has already devoured Ireland and Latvia (and a number of Latin American countries) and is underway in Ukraine. The current newspaper headlines reporting an agreement being reached between the IMF and Germany about writing down the Greek debt to a level that could be serviced are false. No “creditor” has yet agreed to write off one cent of the debt. All that the IMF has been given by so-called “creditors” is unspecific “pledges” of an unspecified amount of debt writedown two years from now. Click here to read Paul Craig Roberts’ full article. The overarching agenda of the EU – a plan rarely mentioned above a murmur – is to fuse its member nations under unelected technocratic governance for the benefit of a few corporations and the oligarchs who own them. So the notion that sticking by the EU is some sense an act of European solidarity is extremely misguided. Having already sold many of its people down the river, however, we are rapidly approaching a critical and perilous moment. The far-right is now on the rise in many parts of Europe – Greece being an example, although thankfully Golden Dawn remains very much a minority party. And this swing towards ring-wing extremism is a direct consequence of the EU’s savage economic policies combined with its abject failure to save refugees and resolve the so-called “migrant crisis” (more in a later piece). As this alarming political shift occurs, the EU does next to nothing to address it. No debt relief for Greece or the other struggling member states. No let up on enforced “austerity” or privatisation. Neo-liberalism to the bitter end. But then, after Greece was collectively punished for the insolence of its ‘oxi’ vote last summer, only the most dewy-eyed believers can remain in serious doubt of the EU’s callous indifference towards the plight of its poorest citizens. It is a dangerous lie to assert that the euro and the EU serve Europeans and shield them from crisis. It is an illusion to believe that Europe’s interests can be protected within the iron cage of the Eurozone’s governance “rules” and within the current Treaties. President Hollande’s and Prime Minister Renzi’s method of behaving like a “model student”, or in fact a “model prisoner”, is a form of surrender that will not even result in clemency. The President of the European Commission, Jean-Claude Juncker, said it clearly: « there can be no democratic choice against the European treaties ». This is the neoliberal adaptation of the « limited sovereignty » doctrine invented by the Soviet leader Brezhnev in 1968. Then, the Soviets crushed the Prague Spring with their tanks. This summer, the EU crushed the Athens Spring with its banks. We are determined to break with this “Europe”. It is the basic condition needed to rebuild cooperation between our peoples and our countries on a new basis. How can we enact policies of redistribution of wealth and of creation of decent jobs, especially for the young, ecological transition and the rebuilding of democracy within the constraints of this EU? We have to escape the inanity and inhumanity of the current European Treaties and remould them in order to shed the straightjacket of neoliberalism, to repeal the Fiscal Compact, and to oppose the TTIP. We live in extraordinary times. We are facing an emergency. Member-states need to have policy space that allows their democracies to breathe and to put forward sensible policies at the member-state’s level, free of fear of a clamp down from an authoritarian Eurogroup dominated by the interests of the strongest among them and of big business, or from an ECB that is used as a steamroller that threatens to flatten an “uncooperative country”, as it happened with Cyprus or Greece. We should reject wholeheartedly the fudge that David Cameron came back from Brussels with. He is asking the public to support staying within a reformed Europe, but he has deformed Europe in the process of creating this fudge. Which is surely a noteworthy admission (hence the bold emphasis) from the person most prominent in the left-wing half of the campaign to stay. Click here to read more of the transcribed interview with Yanis Varoufakis in which discusses the launch of his new ‘Democracy in Europe’ movement (DiEM25). When Michael Chessum, a major organiser of the pro-Remain ‘Another Europe is Possible’ (AEiP) movement, is questioned about what concrete ‘changes’ he would like to see in EU, he simply dodges the question. Chessum’s behaviour generalises. To my knowledge, not a single supporter of Remain has presented a satisfying answer to the question of how we are supposed to go about reforming the EU. Even Yanis Varoufakis during his recent ‘Lunch with the Financial Times’ interview confessed that in reality the EU isn’t going to be reformed to anywhere near the extent the Remainers are hoping for (attempts to reform ‘will probably end in failure like all the best intentions’, he claimed). Even Remain supporter Ed Rooksby can write on his blog about how he is ‘not particularly convinced by arguments emanating from [AEiP] in relation to the possibility of transforming EU institutions in a leftist direction’. How is a new, reformed EU possible? How can we change it to break from the Washington Consensus? The answers are, worryingly, not forthcoming. writes Elliot Murphy in a recently published Counterpunch article in which he deliberates on all sides of the EU referendum campaign. None of us support the status quo; we all recognise radical institutional and political change is needed. Most of us also know, however, that a British exit would leave workers even more vulnerable to a Tory government and would not be a step towards the social Europe we believe in. As a cautious but committed internationalist, I have a great deal of sympathy with their position. Undeniably Europe needs a fresh start founded upon an economic ‘new deal’ that can halt a disastrous economic decline and rescue the poorest partner nations. To be nitpicking, however, such vitally needed investment must be injected into infrastructure projects and to boost productive capacity rather than less intangibly into “jobs and growth”. Without productive activity, creation of “jobs and growth”, irrespective of ‘sustainability’, will not secure long-term economic prosperity. But the significant and most probably insurmountable difficulty is here comes in the shape of the EU institutions themselves. For these undemocratic institutions are not merely disinclined to make the sorts of ‘new deal’ investments required, but staunchly antithetical to ‘bailouts’ of every kind other than those needed to keep afloat the “too big to fail” banks. ‘We stand with those who have most to lose in the EU referendum campaign: with the children of workers who have lost child benefit, with the migrants who face further unjust vilification as the debate rages. ‘We stand with the tens of thousands fleeing war in Syria, Iraq and elsewhere. Your pro-EU stance seems to suggest that leaving the EU is a preoccupation of the Tory right and all voters of the centre-left should be pro-EU because it somehow represents progressive politics and is a vague force for good. But this is a huge betrayal of the sections of society you purport to speak for. Quite clearly an unlimited supply of low-skilled labour – which is what freedom of movement represents – makes it ever easier for employers to offer zero-hours or insecure employment, both for migrants and for British low-paid. This is benefiting only business owners not known for their public-mindedness or even paying any tax. How can anyone on the left be in favour of a system that perpetuates this? Any improvements to workers’ rights the EU may have secured have been and will continue to be fundamentally undermined by this, and arguing that we can change this from within is pie in the sky – as the difficulties Cameron’s negotiations have encountered clearly show. And aside from the economic impacts on the poorer sections of society, it’s ironic that those on the left, particularly Labour MPs, support membership of an organisation that is so deeply undemocratic and undermines the role of ordinary people in the law-making/representation process. To which I simply wish to add a single, small, but important, caveat. The EU is not driven much if at all by the demands of either the French or Germans, presuming that we are speaking of the French and German people (and if it were, then it would bear a better semblance to democracy). It is instead an apparatus serving corporate interests, the most powerful of which are the major banks. So for “Germany and France” it is better to read: Deutsche Bank, BNP Paribas and Société Générale. This groundswell of support for Remain across substantial parts of the Left is hard to square with the facts. State aid to declining industries, along with renationalisation, are not permitted by current EU laws (under directive 2012/34/EU), and any mildly progressive government which managed to get elected in 2020 would be hindered from the outset by the EU. Considerable reforms of the energy market would also be illegal under EU directives 2009/72EU and 2009/73/EU. Collective bargaining is becoming much weaker across the EU, most vividly in France and Germany. McDonnell’s plans for People’s Quantitative Easing? Outlawed by Article 123 of the Treaty on the Functioning of the European Union. The series of anti-trade union laws introduced in Britain over the past few decades? The EU has no qualms with these whatsoever, showing no interest in providing even modest forms of protection for workers. As the Labour Leave campaign points out, the EU would also outlaw an end to NHS outsourcing, tougher measures on tax avoidance, and general improvements to workers’ rights. The soft Left’s talk of international solidarity and the brotherhood of man in relation to the EU is absurd, especially as it continues to drive forward deeply militaristic and undemocratic (or rather, anti-democratic) policies. The EU is, after all, one the world’s major post-war imperialist projects, boasting an inherently and aggressively exploitative relation with the global South. The entirety of the EU parliament could be filled with McDonnells and Iglesias’s and no substantial reform would be forthcoming: The parliament is an institution purely of amendment and all power lies with the civil servants and the unelectable Commission. Click here to read Elliot Murphy’s full article. Goldman Sachs has two senior representatives on Bilderberg’s steering committee: James A. Johnson, a board member of the bank, and Robert Zoellick, the chairman of Goldman Sachs’ board of international advisors. We know from Charity Commission accounts that Goldman Sachs, along with BP, is one of the key funders of the group, and we also know that they’ve been pumping “a substantial six-figure sum” into the Remain campaign. And Goldman Sachs doesn’t spend money lightly. The Remain campaign is clearly close to whatever they have instead of a heart. For Bilderberg, as for Goldman Sachs, the idea that there might be any kind of push-back against globalisation is a horrific one. I suspect we’ll glimpse some frowning faces behind the tinted glass as the limousines start rolling up on Thursday. Click here to read Charlie Skelton’s full article. With due respect, the choice as you present it is a false one. Firstly, voting to stay inside the EU will automatically mean assenting to Plan A – there is no Plan B. On the other hand, there are many reasons to vote to leave the EU (not mentioned above) that have nothing whatsoever to do with building walls and a fortress Europe – which is something happening in the extant EU. As is the financial ruin of Greece, Spain, Portugal and Ireland. And as is TTIP. The EU is a technocracy run at the behest of the corporations and big finance that urgently needs to be undone. The current disintegration of Europe is happening largely because of policies of the EU. Certainly the nations of Europe must survive, but if this to happen then it may be necessary for the EU to perish. Posted on February 24th 2016. Pre-publication summary: Five months of intense negotiations between Greece and the Eurogroup never had a chance of success. Condemned to lead to impasse, their purpose was to pave the ground for what Dr Schäuble had decided was ‘optimal’ well before our government was even elected: That Greece should be eased out of the Eurozone in order to discipline member-states resisting his very specific plan for re-structuring the Eurozone. How do I know Grexit is an important part of Dr Schäuble’s plan for Europe? Because he told me so! I wrote this article not as a Greek politician critical of the German press’ denigration of our sensible proposals, of Berlin’s refusal seriously to consider our moderate debt re-profiling plan, of the European Central Bank’s highly political decision to asphyxiate our government, of the Eurogroup’s decision to give the ECB the green light to shut down our banks. Since the Greek people registered their defiant “no to austerity” at last weekend’s plebiscite, like many, I have been struggling to understand what that vote really means and where this is now heading both for Greece and the rest of the Eurozone. In searching for answers I have found that three different questions are inclined to separate out; questions that involve one another in a vaguely hierarchical fashion a little like Russian dolls. I have therefore decided to try to address each of these nested questions in turn beginning with the outermost first. “The Greeks have been living beyond their means for years,” said one man, visiting Berlin from Osnabrück, Lower Saxony. “I used to play in a volleyball team in the 1970s and 80s and we traveled all over the world. I’ve been to Istanbul and I’ve been to Brasil and I’ve never seen a country like Greece. The quotes above were part of an article sent to me by a friend living in Germany – a friend who happens to spend the other half of his time living in Greece. The remarks, he says, perfectly exemplify the sorts of opinions he most frequently hears. The Greeks caused the crisis, they should pay what they owe, and follow the rules like the Germans would. It’s all exceedingly simple, and all extremely badly informed. Like many ‘good Europeans’, the German people are being held hostage to two falsehoods. One is that the crisis came about primarily because of indolence, inefficiency and impropriety. Put baldly, that Greeks are a bunch of lazy tax cheats. The only part missing here is the word untermensch; the tinge of latent bigotry is unmistakeable. I have argued against this nonsense many times and so it pains me to have to repeat myself at all. But the facts are there for anyone who cares to look. Figures that unequivocally prove that Greeks work extremely hard: harder on average in fact than Germans do. Their productivity is lower and so perhaps there is an issue over efficiency, and tax revenues are indeed harder to secure, but this is very much a problem that gets far worse as you climb the social ladder (as it does in every society). Goldman Sachs faces the prospect of potential legal action from Greece over the complex financial deals in 2001 that many blame for its subsequent debt crisis. A leading adviser to debt-riven countries has offered to help Athens recover some of the vast profits made by the investment bank. The Independent has learnt that a former Goldman banker, who has advised indebted governments on recovering losses made from complex transactions with banks, has written to the Greek government to advise that it has a chance of clawing back some of the hundreds of millions of dollars it paid Goldman to secure its position in the single currency. Click here to read the full article in yesterday’s [July 11th] Independent. Only a small fraction of the €240bn (£170bn) total bailout money Greece received in 2010 and 2012 found its way into the government’s coffers to soften the blow of the 2008 financial crash and fund reform programmes. Most of the money went to the banks that lent Greece funds before the crash. Less than 10% of the bailout money was left to be used by the government for reforming its economy and safeguarding weaker members of society. Yes, more than 90% of the bailout money went straight back to the creditors – much of it German money to prop up German banks. Parallel to this overarching question of who is responsible for the debt is the question of who should now repay it. To the (wo)man on the street – and especially those auf der Strasse – this tends to be treated as if it were the self-same question, but it isn’t, and for the simple reason that a debt that cannot be repaid will never be repaid. In ordinary life we know this is true, which is why in our private lives we are disinclined to lend money other than to those we most trust. After all, it is very much the responsibility of every creditor to lend their money wisely, and this applies to banks and global institutions no less than it applies to you and me. But there are also international laws determining the legitimacy of debts. A committee convened by the Greek parliament has claimed much of the country’s debt of 320bn euros was illegally contracted and should not be paid. Following an official parliamentary investigation, speaker Zoe Konstantopoulou described the debt as illegal, illegitimate and odious. Needing a strong West Germany as a bulwark against communism, the country’s creditors came together in London and showed that they understood how you help a country that you want to recover from devastation. It showed they also understood that debt can never be seen as the responsibility of the debtor alone. Countries such as Greece willingly took part in a deal to help create a stable and prosperous western Europe, despite the war crimes that German occupiers had inflicted just a few years before. The debt cancellation for Germany was swift, taking place in advance of an actual crisis. Germany was given large cancellation of 50% of its debt. The deal covered all debts, including those owed by the private sector and even individuals. It also covered all creditors. No one was allowed to “hold out” and extract greater profits than anyone else. The German debt deal was a key element of recovering from the devastation of the second world war. 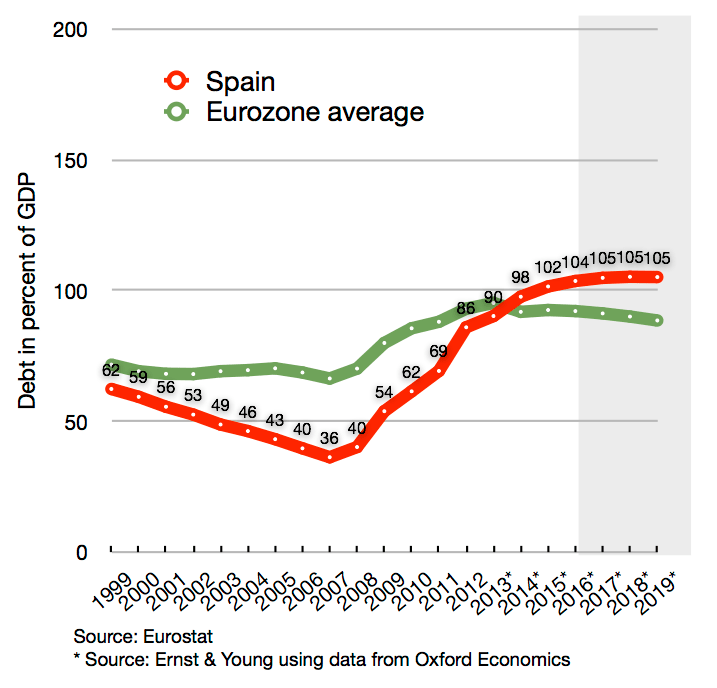 In Europe today, debt is tearing up the social fabric. Outside Europe, heavily indebted countries are still treated to a package of austerity and “restructuring” measures. Pakistan, the Philippines, El Salvador and Jamaica are all spending between 10 and 20% of export revenues on government foreign debt payments, and this doesn’t include debt payments by the private sector. Unfortunately, today’s neo-liberal belief holds that debt is sacrosanct. So that whereas West Germany was only required to pay for debts out of its trade surplus, and thus its creditors had a vested interest in wishing to see economic growth, the creditors in the current crisis demand their pound of flesh irrespective not only of broader social consequences, but seemingly even of their debtors ability to keep up with repayments. 2. To Grexit or not to Grexit? The debate over whether Greece would be better inside or outside of the Eurozone has been ongoing for just as long as the crisis itself. And once again, we can break the argument down into component parts, of which one claim is that the Eurozone per se was an inherently flawed concept that remains utterly unworkable in its current form. This is very possibly the case, although not a subject I feel comfortable discussing – it is beyond my technical understanding. However, whether the Eurozone is ultimately workable or not, and regardless of whatever costs to democracy and national sovereignty might be needed to completely fix it, we can certainly see that this current crisis did not arise from the formation of the monetary union. Rather, this so-called “debt crisis” began as a banking crisis, and one that can be easily traced back to the American subprime mortgage crisis, the origins of which again, in reality trace back to the financial deregulation begun under Thatcher and Reagan, and then continued by Clinton, Blair and Brown. The subprime mortgage/banking crisis of 2008 never truly ended, and the western financial system only limps on thanks to sporadic bailouts, unlimited QE and zero interest rates. Better understood, and as already discussed above, the so-called bailouts of Greece have been little more than a continuation of the earlier banker bailouts. So what of the second option – the one that already has the stupid text-style name of Grexit? Should Greece abandon the Euro altogether? Well, firstly, the Greeks cannot be forced to drop out of the Eurozone – or at least there is no recognised mechanism for expelling any member nation. Secondly, it should be noted that the Greek people don’t want to leave the Eurozone. Like most of the peoples of Europe, these days they are broadly enthusiastic about the European project. Added to this, they also clearly recognise the serious risks of trying to suddenly go it alone in such perilous times. Once isolated, the Drachma would be mercilessly attacked by the same predatory banks and hedge funds that are currently threatening to bring down the Euro. The Drachma wouldn’t stand the ghost of a chance. Which brings us to an impasse. Accept “austerity” or get out! Jump off a cliff or suffer slow death by a thousand cuts. Is there really no genuine alternative for the Greeks? The threat of Grexit has had a brief rollercoaster of a history. In 2010 it put the fear of God in financiers’ hearts and minds as their banks were replete with Greek debt. Even in 2012, when Germany’s finance minister, Wolfgang Schäuble, decided that Grexit’s costs were a worthwhile “investment” as a way of disciplining France et al, the prospect continued to scare the living daylights out of almost everyone else. By the time Syriza won power last January, and as if to confirm our claim that the “bailouts” had nothing to do with rescuing Greece (and everything to do with ringfencing northern Europe), a large majority within the Eurogroup – under the tutelage of Schäuble – had adopted Grexit either as their preferred outcome or weapon of choice against our government. Greeks, rightly, shiver at the thought of amputation from monetary union. Exiting a common currency is nothing like severing a peg, as Britain did in 1992, when Norman Lamont famously sang in the shower the morning sterling quit the European exchange rate mechanism (ERM). Alas, Greece does not have a currency whose peg with the euro can be cut. It has the euro – a foreign currency fully administered by a creditor inimical to restructuring our nation’s unsustainable debt. This weekend brings the climax of the talks as Euclid Tsakalotos, my successor, strives, again, to put the horse before the cart – to convince a hostile Eurogroup that debt restructuring is a prerequisite of success for reforming Greece, not an ex-post reward for it. Why is this so hard to get across? I see three reasons. One is that institutional inertia is hard to beat. A second, that unsustainable debt gives creditors immense power over debtors – and power, as we know, corrupts even the finest. But it is the third which seems to me more pertinent and, indeed, more interesting. The euro is a hybrid of a fixed exchange-rate regime, like the 1980s ERM, or the 1930s gold standard, and a state currency. The former relies on the fear of expulsion to hold together, while state money involves mechanisms for recycling surpluses between member states (for instance, a federal budget, common bonds). The eurozone falls between these stools – it is more than an exchange-rate regime and less than a state. And there’s the rub. After the crisis of 2008/9, Europe didn’t know how to respond. Should it prepare the ground for at least one expulsion (that is, Grexit) to strengthen discipline? Or move to a federation? So far it has done neither, its existentialist angst forever rising. Schäuble is convinced that as things stand, he needs a Grexit to clear the air, one way or another. Suddenly, a permanently unsustainable Greek public debt, without which the risk of Grexit would fade, has acquired a new usefulness for Schauble. What do I mean by that? Based on months of negotiation, my conviction is that the German finance minister wants Greece to be pushed out of the single currency to put the fear of God into the French and have them accept his model of a disciplinarian eurozone. Click here to read Yanis Varoufakis full article. 3. How well are Varoufakis, Tsipras and Syriza playing their hand? From a fascinating breakdown of the “Nine Myths About the Greek Crisis” written by fellow economist James K. Galbraith. As we await the decision of the Eurogroup, much of the mainstream media has been quick to draw attention to what it describes as the Greek government ‘climbdown’. So we hear how they have backed down on taxation, on pensions, on public spending and on privatisation. Following on from the dramatic “OXI” vote of last Sunday, it is quite easy to feel deflated by this. Indeed, the harshest critics of Tsipras (Varoufakis is out of range) – critics both from left and right – say that Syriza have managed to let a ‘no’ slip into a ‘yes’. But then the voices that dominate the mainstream media have an axe to grind; the usual neo-liberal axe. So when they play up Syriza’s ‘climbdown’ we should look rather carefully into the details (I will offer further thoughts on this at the end). Meanwhile, the alternative voices who say that Greece ought to have followed Iceland’s example are missing a great many points of significant difference between the two nations: the size of populations, the make-up of their respective economies, and the rather important fact that Iceland were never part of the Eurozone or stuck in any kind of currency union. The World Socialist Web Site calls on Greek workers not to give any political support to Syriza. There is no party in this election that represents the interests of the working class. That was the position of the International Committee of the Fourth International (ICFI) as outlined on their website wsws.org on the eve of the Greek elections. It took just hours for the leftist pretensions of Syriza, (the Coalition of the Radical Left) to be exposed following its victory in Sunday’s Greek general election. On Monday morning, Syriza leader Alexis Tsipras held talks lasting barely an hour with Panos Kammenos, leader of the right-wing, anti-immigrant Independent Greeks (ANEL). Following the talks, Kammenos announced that the Greek government would be a Syriza-Independent Greeks coalition. Syriza’s coalition with ANEL was prepared well in advance. In March 2013, Syriza entered into a “front” with ANEL based on efforts to save the Cypriot banks with aid from the European Union (EU). This alliance has been, I’m afraid, a forced and quite pragmatic type of choice, devoided of any grand strategic design. And since Syriza’s offer of an alliance with the other force of the radical left has been categorically rejected by the latter, this possibility has been explored since a while and was therefore easy to materialize once the election result was known. Click here to read more at Richard Seymour’s popular blog Lenin’s Tomb. Now everyone is perfectly entitled to their opinion about Syriza and Alexis Tsipras. If they believe that they are fakers then they should say so. But there is something deeply self-destructive about certain elements within the left. The reason is simple. For half a century and more as the left has been remorselessly beaten into submission by very powerful corporate and oligarchical interests, this sustained period of bruising defeats has created a feeling of resignation and a loser mentality, creating schisms that were so memorably lampooned by Monty Python’s Life of Brian. But there’s also another point that desperately needs hammering out, which is the radical left’s obsession with intellectual legitimacy. Marxists, Trotskyists, and even Maoists (the madness of some on the far left simply knows no bounds!) who scrutinise and disparage one another over matters of conjectural doctrine, dismissing rival camps on grounds that alternative interpretations to their own are pseudo- and bourgeois. Meantime, the world moves on, and beyond the narrow confines of these inner party squabbles, there is no effect whatsoever on any practical advancement. The bigger joke being there are few preoccupations even half as petty-bourgeois as splitting hairs over Marx and Engels; one the son of a Jewish lawyer, the other the eldest son of a wealthy German cotton manufacturer. For few in the proletariat care one jot for the ideological legitimacy of the left (or the right for that matter) – and why would they? They have more pressing concerns like putting food on the table and a roof over their head: a reliable income and fortnight’s holiday abroad are the main concerns of the ordinary Joe. Surely then, those on the left, especially the radical left, ought to strive to put programme above dogma. Since the masses, however miserable, will never be roused and politically animated by dry theory. And isn’t this where the revolution is expected to spring forth from? For so long as the left keep bickering on about who is more properly socialist, then the right will easily steal in. Because the right, especially at its vilest extremes, is devoid of the same intellectual hang-ups, which is why, even when their closet intention is to coerce and oppress the poor and the workers by means of sectarian division, the right manages to gain so much traction amongst the ranks of the lower classes. The left needs to learn this lesson quickly; those self-aggrandising gangs of thugs like Golden Dawn are sharpening their knives and once Syriza are seen to have failed, the next act may be a diabolically familiar one. Greece will hold a referendum on a new European Union aid package intended to resolve the country’s debt crisis, Prime Minister George Papandreou says. Analysts say a referendum could derail the wider deal on the euro debt crisis. Speaking after the G-20 meeting in Cannes, US President Barack Obama questioned Prime Minister George Papandreou’s proposal to hold a referendum on the country’s eurozone debt deal and applauded New Democracy leader Antonis Samaras for backing last week’s Brussels agreement. “We came to Cannes to discuss with our European friends how they will move forward and build upon the plan they agreed to last week to resolve this crisis,” he said. Obama said the “actions of Papandreou and the referendum issue got a lot of people nervous.” He added that the plan European leaders presented last week is “still the best recipe.” He commended Samaras for saying he would support the bailout after the referendum proposal was dropped. It was an episode that led to Papandreou’s resignation and the appointment of former Governor of the Bank of Greece and Vice President of the ECB, Lucas Papademos, as interim Prime Minister. Following which, the “austerity” went on, the “debt crisis” deepened, and still the Greeks were yet to have a real say in what was happening to their country. So wrote economist James K. Galbraith prior to last weekend’s momentous referendum. And what he says is correct. The Greeks have indeed voted to stay in Europe and the Eurozone, having never offered Syriza any mandate to leave. As it transpires, they may now be forced out, or at the very least, forced into another general election. Syriza may then be obliged to stand on a ‘we will leave the euro ticket’, which, and as popular as Syriza are, would mean an election that they would currently be unlikely to win. But then, as my friend in Germany points out, leaving aside the Greek concessions for a moment, this weekend’s deal pivots upon massive debt restructuring/cancellation, which is why Syriza have felt compelled to offer Germany the chance to wrestle some kind of victory, whilst returning to Greece as winners too. If a deal can be struck, then certainly hardliners on both sides will come away disappointed, and this is one reason any deal may very likely fall through. another landslide victory as the Greeks say OXI! everywhere is OXI! all say NEIN! Following the financial crisis (which was actually a banking crisis, as I have pointed out many times before), it was Greece that was unfortunate enough to have been singled out and placed at the head of the queue for dose after dose of neo-liberal economic shock therapy. The financial group formerly known as “the Troika” — the IMF, ECB and EU — were exceedingly quick when it came to imposing their strict austerity programme, backed up with further ‘Washington Consensus’-style ‘conditionalities’ — the enforced privatisation of public services and other forms of so-called ‘deregulation’. More than half a decade on, and rather than prosperity, “austerity” (i.e., savage cuts – I always apply apostrophes) has created a vicious debt spiral, with mass unemployment and reduced incomes leading inexorably to reduced demand, stifled economic growth and, as a direct and consequence, lost tax revenues that would otherwise have been available for government investment. Along the way, money has been deliberately siphoned from the poorest in society to the wealthiest. But then “austerity” automatically provides a wonderful excuse for this sort of wealth redistribution. Six months ago, the Greeks voted in the anti-austerity government Syriza. Their message then was already clear: “austerity” simply does NOT work! They had had enough. Now with today’s dramatic referendum result they have said ‘enough’ a second time – in effect this was a landslide vote calling for a complete end to “austerity” and even more loud and clear than when Syriza were first elected. What happens next is uncertain. The real fight for the future of their country is perhaps only just beginning. But the vote shows both the strength of support for the Syriza government as well as the tremendous courage of the Greek people to continue to take a stand against the Eurogarchs. To win by such a margin was a remarkable victory. What the Greek people achieved today provides yet another boost in our own fight against “austerity”. Here is a very short report on Monday’s [July 7th] Democracy Now! featuring Costas Panayotakis, professor of sociology at NYC College of Technology at City University of New York, and author of Remaking Scarcity: From Capitalist Inefficiency to Economic Democracy. Well, the situation in Greece is still very difficult. It is urgent, because the banks are closed, so the normality in the banking system has to be restored. As long as it is not restored, it basically will have a bad effect on the economy. And this creates lots of pressure, of course, on the Greek government, and it is consistent with a strategy of economic strangulation of—that the Europeans have used ever since the election of this new anti-austerity government. He’s not a sort of long-term politician. So he doesn’t want to just—he didn’t want to just achieve an agreement that would last a few months and would continue this kind of pattern of agreements that are made and have to be reconsidered and revisited a few months later. So that made him very, very unpopular with his partners, who are the more traditional politicians. Perhaps it was partly a stylistic issue, as well. You know, he wasn’t—you know, finance ministers in the eurozone are usually very sort of gray, sort of technocratic figures, so perhaps his style was commented on. But I think there was substantial differences, and he basically held for his position, which was substantially right. Click here to read the full transcript or to watch the debate on the Democracy Now! website. Top Syriza officials say they are considering drastic steps to boost liquidity and shore up the banking system, should the ECB refuse to give the country enough breathing room for a fresh talks. “If necessary, we will issue parallel liquidity and California-style IOU’s, in an electronic form. We should have done it a week ago,” said Yanis Varoufakis, the finance minister. Syriza sources say the Greek ministry of finance is examining options to take direct control of the banking system if need be rather than accept a draconian seizure of depositor savings – reportedly a ‘bail-in’ above a threshhold of €8,000 – and to prevent any banks being shut down on the orders of the ECB. Government officials recognize that this would lead to an unprecedented rift with the EU authorities. But Syriza’s attitude at this stage is that their only defence against a hegemonic power is to fight guerrilla warfare. Hardliners within the party – though not Mr Varoufakis – are demanding the head of governor Stournaras, a holdover appointee from the past conservative government. They want a new team installed, one that is willing to draw on the central bank’s secret reserves, and to take the provocative step in extremis of creating euros. “The first thing we must do is take away the keys to his office. We have to restore stability to the system, with or without the help of the ECB. We have the capacity to print €20 notes,” said one. Such action would require invoking national emergency powers – by decree – and “requisitioning” the Bank of Greece for several months. Officials say these steps would have to be accompanied by an appeal to the European Court: both to assert legality under crisis provisions of the Lisbon Treaty, and to sue the ECB for alleged “dereliction” of its treaty duty to maintain financial stability. On Tuesday [July 7th], Democracy Now! ran a rather more extended report on the Greek crisis in the light of their defiant rejection of “austerity”. They spoke with Richard Wolff, author of several books, including, most recently, Democracy at Work: A Cure for Capitalism, and emeritus professor of economics at University of Massachusetts, Amherst, as well as Channel 4 News skittish economics editor, Paul Mason. The irony here, the historical irony, is something I think we need to understand. Back in 1953, the Germans, with a very crushed economy—in that case, because of the Great Depression and the fact that they lost World War II—went to the United States, France and Britain and said, “We can’t join you as a bulwark against the Soviet Union unless you relieve us of our enormous debts, which are hampering our ability to grow.” Across 1953, they had meetings in London. When those meetings concluded, with the so-called London Agreement, here’s what Germany got from the United States, France and Britain: 50 percent of their outstanding debt, which was very high, was erased, and the other 50 percent of their debt was stretched out over 30 years. In effect, Germany got the relief of all of its basic indebtedness, based on two world wars that they were held accountable for, and that enabled them to have the so-called Wirtschaftswunder, the economic miracle that happened. They now refuse to give to Greece what they got. They refuse to allow Greece to have the chance to solve its economic problems just the way Germany asked for and got. And this discrepancy between these two countries is producing a stress inside Europe that is, what Paul Mason correctly points to, fundamentally dangerous to the whole project of a United States of Europe. The Germans are victims of their own propaganda. They converted an economic crisis into a nationalist, we-versus-them mentality—we, Germans who work hard, against the Greeks, who don’t. Reminded me of nothing so much as Mr. Romney’s unfortunate remark in the last campaign where he divided Americans into the 47 percent moochers and the 53 percent who work hard, trying to get the 53 percent to believe they were carrying the other 47. That’s what the Germans have done. “We Germans work very hard, and we’re carrying these lazy Greeks.” This—put aside the questionable issue of whether the Germans ought to play such a nationalist card, given their history, but this is a way of solidifying opposition to what’s going on, and this is a very, very dangerous track. But she may be trapped by it. She has done it now. So, as Paul said, her own people wouldn’t support making a deal. She’s made that impossible for herself. There’s no question in my mind, from the evidence we have, that the American government is more interested with a stable Europe than with provoking this kind of a split inside Europe, partly because of the ramifications here in this country, where the same anti-austerity is building. That’s one of the causes for the support for Bernie Sanders, for example. But he’s also concerned that the Germans are making a classic political error, going way too far, and that this will disturb global markets. The economic recovery in this country is very weak and very fragile, and that doesn’t want disturbance to come from a powerhouse like Europe. The eleventh hour intercession by the IMF was intriguing. Why decide to put out its “Debt Sustainability Analysis” draft report which confirms that Greek debt repayment is unsustainable whilst announcing Greece’s need for large-scale debt relief to create “a breathing space” on the very eve of such a crucial vote? A statement that came as grist to the mill for the “no” campaign, was cited by Alexis Tsipras in his televised appeal to voters, and, hardly surprising, was frowned upon by other Eurozone countries that tried to block its release. Yet, seemingly at the behest of Washington and in defiance of Berlin, the IMF went ahead anyway. Perhaps after all is said and done, the powers that be need chaos, need instability, need panic in order to ensure the public gratefully accept the all-in QE-fest that they want. If the inflexible Germans were to have Greece booted from the EU, Greece’s turn to Russia and financial rescue would put the same idea in the heads of Italy and Spain and perhaps ultimately France. NATO would unravel as Southern Europe became members of Russia’s Eurasian trade bloc, and American power would unravel with NATO. This is simply unacceptable to Washington. If reports are correct, Victoria Nuland has already paid a visit to the Greek prime minister and explained to him that he is neither to leave the EU or cozy up to the Russians or there will be consequences, polite language for overthrow or assassination. Indeed, the Greek prime minister probably knows this without need of a visit. I conclude that the “Greek debt crisis” is now contained. The IMF has already adopted the Greek government’s position with the release of the IMF report that it was a mistake from the beginning to impose austerity on Greece. Pressured by this report and by Washington, the EU Commission and European Central Bank will now work with the Greek government to come up with a plan acceptable to Greece. This means that Italy, Spain, and Portugal can also expect more lenient treatment. The losers are the looters who intended to use austerity measures to force these countries to transfer national assets into private hands. I am not implying that they are completely deterred, only that the extent of the plunder has been reduced. Time will tell if Roberts is right. Well, I don’t know why—I mean, I don’t know why the finance minister quit. Obviously, you know, the European—the other finance ministers and European authorities wanted him out, and they said it was his negotiating style and things like that. I don’t know that that makes much difference. You know, the main thing, again, is whether they can get a deal that allows for an economic recovery. You know, this is the ironic thing about it, is that the European authorities have made this mess. The reason they need all this debt relief is because the economy has shrunk by more than 25 percent and greatly reduced their ability to pay. And now, the IMF is already saying—or the IMF has already acknowledged that the debt is unsustainable. And some of that is U.S. influence. You know, you have a difference between the U.S. and the European Union, or the European authorities, I should say, because the U.S. is only concerned with keeping Greece in the euro, whereas the others have this project. They want to transform Europe into a place that has a smaller social safety net, a reduced state, cuts in pensions and healthcare. This isn’t just Greece. Greece is the obstacle in their way of transforming Europe. So they have these whole set of other interests that they’re fighting for, and that’s why they’re being so brutal and stubborn about this. So, again, you know, we don’t really know what’s going to happen yet. We don’t know whether they’re going to grant sufficient debt relief to allow for an economic recovery. So I think this fight is going to go on for a while. In other words, Washington and Berlin have somewhat divergent interests — interests that, as Paul Craig Roberts indicates, may hinge on Washington’s grander and more lunatic geostrategic objectives. To those who say that, effectively, this is a referendum on the euro, my answer is: You may very well say this but I shall not comment. This is your judgement, your opinion, your interpretation. Not ours! There is a logic to your view but only if there is an implicit threat that a No from the Greek people to the institutions’ proposal will be followed up by moves to eject Greece, illegally, out of the euro. Such a threat would not be consistent with basic principles of European democratic governance and European Law. To those who instruct us to phrase the referendum question as a euro-drachma dilemma, my answer is crystal clear: European Treaties make provisions for an exit from the EU. They do not make any provisions for an exit from the Eurozone. With good reason, of course, as the indivisibility of our Monetary Union is part of its raison d’ etre. To ask us to phrase the referendum question as a choice involving exit from the Eurozone is to ask us to violate EU Treaties and EU Law. I suggest to anyone who wants us, or anyone else, to hold a referendum on EMU membership to recommend a change in the Treaties. As the EU and the ECB back Greece into a corner yet again, Finance Minister Yanis Varoufakis has issued the following statement and a full copy of his presentation to the Eurogroup meeting. If there is a default at the end of June followed by Grexit (meaning Grexpulsion), then no-one can seriously claim that Varoufakis and Syriza did not try in every way to prevent it. Indeed, one wonders if compromise was ever possible given how it now appears that the technocrats heading the ECB and the EU care nothing for Greece and surprisingly little for the future of the EU itself. But Syriza should also beware that they do not compromise too much; for that would be the worst defeat of all. Q: At the onset of the crisis, the former Finance Minister Papaconstantinou likened the Greek economy to the “Titanic” heading straight for the iceberg. Do you also feel as if you are standing on the bridge of the “Titanic”? A: No. The “Titanic” sank a while ago. We’re steering the lifeboat and throwing lifebelts to those drowning around us. “austerity”, what is it good for…? As the economies of the western world continue to flounder, with Germany too (Europe’s last remaining industrial powerhouse) reeling just a little from the greater crisis, debt reduction is still regarded as the key component to any recovery programme. To meet these ends, all our governments have been overseeing huge cuts in public services, welfare payments especially gouged, in concerted efforts to reduce their deficits. This death of our societies by a thousand cuts of “austerity” being the recommended cure which mainstream economists have called for, and though alternative voices have no less insistently pointed out that “austerity measures” are inherently counterproductive (since they reduce tax revenues), these dissenting voices continue to be marginalised. A few years ago Thomas Herndon stepped forward. Herndon, a university student and thus less rigid in his outlook, caused quite a rumpus – as a consequence, he has since been rewarded with his own wikipedia entry. This sudden burst of fame coming after he inadvertently stumbled upon grievous errors in an influential paper entitled Growth in a Time of Debt (published 2010), authored by eminent Harvard professors, Carmen Reinhart and Ken Rogoff – Rogoff, a former chief economist at the IMF. In their paper, Reinhart and Rogoff had purported to show that whenever national debt is in excess of 90% of GDP, growth is “roughly cut in half”. This correlation had subsequently been quoted by policy-makers across the world, as well as routinely served up as empirical proof that there was simply no viable alternative to our continuing “austerity” programmes. Most notably, perhaps, former EU Commissioner for Economic and Monetary Affairs, Olli Rehn, leant rather heavily on Reinhart and Rogoff’s work. But then doubting Thomas Herndon decided to check their figures for himself. And, to his own astonishment, discovered that one of the most frequently cited justifications for the imposed “austerity” strategy actually rested upon a few careless mistakes on a spreadsheet! [Herndon had] spotted a basic error in the spreadsheet. The Harvard professors had accidentally only included 15 of the 20 countries under analysis in their key calculation (of average GDP growth in countries with high public debt). Australia, Austria, Belgium, Canada and Denmark were missing. Click here to read more in this BBC news article. We are grateful to Herndon et al. for the careful attention to our original Growth in a Time of Debt AER paper and for pointing out an important correction to Figure 2 of that paper. It is sobering that such an error slipped into one of our papers despite our best efforts to be consistently careful. We will redouble our efforts to avoid such errors in the future. We do not, however, believe this regrettable slip affects in any significant way the central message of the paper or that in our subsequent work. Given such a lack of success, the response is obviously to double-down. Apply more stringent “austerity”; if the original cuts have failed, then they needed to be deeper. In former times the doctors would just have ordered more leeches, or the priests would have demanded a tightening of the cilice. Tougher love. Just too bad if the supposed antidote is the worst of the poison, because orthodoxy asserts that, poison or not, it is the best and only remedy. The really important thing is to never let mere facts (especially incalculable costs like human misery) get in the way of a damned fine economic theory! whose debt is it anyway…? I highly recommend watching the documentary in full, but would also like to offer a brief overview. And who have been the ultimate recipients of all this bailout money? Well, that has remained a closely guarded secret. We ought to be asking why, of course, which Schumann’s documentary does. He also seeks to penetrate the secret itself. In the next sections, I will present a further overview comprising highlights of Schumann’s discoveries, and following the same route (then a little beyond it) as he investigated country by country, across the blighted eurozone. The Irish people have been forced to take on 70 billion euros of additional debt to pay off foreign creditors. France is next with 10 bond holders. Who have an estimated 4 trillion. The first lesson, therefore, is that the solution – any practicable solution – has to include debt cancellation. The Spanish people have been forced to take on 40 billion euros of additional debt to pay off foreign creditors. And who are the creditors of the Spanish banks (particularly Bankia)? When Schumann manages to get hold of a list (thanks to “friendly people that help me”) he discovers that Deutsche Bank again features prominently. “The trial uncovered that the bank figures were falsified by upper management, but now we discover that the same had happened at the lower management levels. So a banking culture developed where employees were rewarded with bonuses so that the upper level did not realise how bad things were at the local branch level… The judge said that there was indeed public control of the bank, but the government supervisors played along. Letting the fox guard the hens is good for nothing. So what is Moreno’s advice to the Germany citizens who are paying to prop up this corrupt system…? Meanwhile, depositors in Cypriot banks (savers as opposed to taxpayers) had more than 6 billion euros seized overnight in a so-called bail-in to pay off foreign creditors. This has crippled many businesses and stifled economic growth in a different way. Greece entered the crisis with a debt-to-GDP ratio of 110% and with around 10% unemployment. It was then put through an “austerity programme” supposedly designed to tackle the debt. Five years and several thousand suicides later, unemployment currently stands at 30% and debt-to-GDP is at around 180%. Greece’s pension funds – patchily run in the first place, say unionists and some politicians – have been savaged by austerity and the terms of the international bailout keeping the country afloat. Workers and pensioners suffered losses of about 10 billion euros ($13 billion) just in the debt restructuring of March 2012, when the value of some Greek bonds was cut in half. That sum is equal to 4.6 percent of the country’s GDP in 2011. Click here to read the full Reuters report. In 2010, what they had done was this: they lied to the Greek people and to the German people. They said to the Greek people: We have avoided bankruptcy. And they said to the German people that the Greeks, they were waivered, now we are going to punish them with austerity. But we will lend them the money because European solidarity demands that. In reality, what they were doing was transferring banking losses from the bankers – the European bankers, all of them – onto the shoulders first of the Greek taxpayers and eventually onto the German taxpayers, because the Greek taxpayers could not shoulder all of this money. It wasn’t a conspiracy. It was a very simple operation: How do we stay in power? Mr [Jean-Claude] Juncker said it. Once he admitted: we know what needs to be done, we just don’t know how to do it and remain in power. Now don’t forget that before 2008, 2010, all parties of government, whether they were Christian-Democratic, Social-Democratic, it doesn’t matter. They had developed this extremely close relationship with the financial sector. They had looked at the financial sector as the cow that would bear the milk from which they would feed all, not only their political parties and careers, but also the welfare state – from the point of view of the Social-Democrats. Q: Your Finance Minister Varoufakis said that he is not afraid of an Armageddon. A: He said in parliament: if you enter into negotiations, you are not seeking a breakup. But you have to keep a breakup in mind as a contingency. I share this view. Q: So you have a Plan B in case Greece does decide to exit from the single currency? A: We don’t need a contingency plan because we will stay in the eurozone. But we won’t achieve this objective at the expense of the weak – like our previous government. – Alexis Tsipras in same interview published in Stern magazine. It is almost precisely three years ago since I wrote a post entitled ‘austerity’ or ‘Grexit’: is there really no better alternative for Greece? There have since been more than two and a half years of unrestrained “austerity” (prior to Syriza’s victory), a “take it or leave it” Hobson’s choice, which has deepened the crisis not only in Greece but across the entire eurozone. ‘Grexit’ has never been a realistic alternative, and as Syriza have maintained from the outset, they have no intention whatsoever of ditching the euro. So ‘Grexit’ becomes ‘Grexident’, in other words, an impossibility. Because any accidental Greek exit can only occur if it is accidentally on purpose, and that would mean ‘Grexpulsion’ – a term the mainstream has yet to adopt for obvious reasons. Well, the answer to that question actually depends upon what you value. If you think that all debts are sacrosanct, then it necessarily follows that the Greeks must go on paying the banks to their bitter end. That the debt is unpayable doesn’t matter. That the debt is the consequence of so much ineptitude and malfeasance within the banking system doesn’t matter either. The Greeks must cough up because otherwise the chaos will worsen (or so we are again constantly given to believe). But if you value human life above money, and recognise that debts that cannot be repaid will never be repaid, then you can begin to think more constructively. In fact, the alternative becomes immediately and blindingly apparent. Since a debt cancellation will inevitably come sooner or later, the only real question is how much longer must the Greeks be punished in the meantime. A way-out of all this mess is entirely possible. It doesn’t involve “austerity” and does not necessarily require a Greek exit from the eurozone. What is needed is simply an end to the bottomless banker bailouts and then new money being made available for reconstruction projects and other productive enterprise within Greece, Spain and elsewhere. Such a ‘New Deal’ injection is unlikely to be offered by the IMF, and neither will it be supported by the likes of Angela Merkel. But it can be fought for by the Greek people themselves, and in this battle to stop the wanton destruction of their nation, as fellow Europeans we should stand with them, recognising that the same aggressive financial interests that have already eviscerated Greece, will be pillaging our own lands soon enough. The paragraphs above are taken from the post I wrote three years ago – yet so little has significantly altered that it remains pertinent enough to repeat it. We will find out the answer to the question posed in the title in the outcome of the contest between the new Greek government, formed by the political party Syriza, and the ECB and the private banks, with whose interests the EU and Washington align against Greece. The new [Syriza] government wants to moderate the agreements made by previous Greek governments that sold out the Greek people. The new government wants to stop giving away at bargain prices Greek public assets to clients of its creditors, and the new Greek government wants to raise the Greek minimum wage so that the Greek people have enough bread and water on which to live. However, for the private bank creditors, for Merkel’s Germany that stands behind the banks, for Washington which could care less about the Greeks, for the Greek elites who see themselves as “part of Europe,” Syriza is something to be rid of. A purpose of the “Greek financial crisis” is to establish that EU members are not sovereign countries and that banks that lend to these non-sovereign entities are not responsible for any losses with regard to the loans. The population of the indebted countries are the responsible parties. And these populations must accept the reduction of their living standards in order to ensure that the banks do not lose any money. Click here to read Paul Craig Robert’s full article. The question is, who is actually right here? Certainly we ought to acknowledge that elements in Paul Craig Roberts’ more conspiratorial outlook are irrefutable, recognising that Goldman Sachs did indeed deliberately help to hide previous government debt in order to extend credit to Greece. The Greeks were set up; this has been established – details of Goldman Sachs involvement can be found in this previous post. Varoufakis is diplomatic, arguably too diplomatic. But then, is Paul Craig Roberts unduly pessimistic when he says that Syriza can now do “very little”, and, in either case, is the very moderate and rather modest approach of Varoufakis a good one, pragmatically speaking? Extending a hand of friendship being unlikely to impress “the powerful rich interest groups that rule the West [who] could not care less about the people over whom they rule” (to quote Roberts again, who knows them well, of course). Yet it may be effective in another way, such relentless persuasion and his “frenzy of reasonableness” at least winning the more public battle for hearts and minds. My own view is that Varoufakis (and Syriza) have adopted a sensible stance, which is in fact evidenced by the harsh criticism they have received from both extreme flanks. Appearing too flexible has made him a target for derision from the more radical (and Communist) left-wing, whereas standing his ground irritates his more powerful opponents working within the establishment (who lash out publicly whenever Varoufakis is out of earshot). Academic-turned-finance minister Varoufakis was called “a time-waster, a gambler and an amateur”, a source privy to the closed-door talks told the news service Bloomberg. Jeroen Dijsselbloem, head of the eurogroup of finance ministers, told reporters in Latvia it was a “highly critical” meeting as Greece had still not agreed a comprehensive and detailed list of reforms. Although there were positive signs, there remained “wide differences to bridge on substance”, he said. ECB president Mario Draghi also betrayed his exasperation and warned that central bank could impose tougher conditions in return for keeping Greek banks afloat. Weeks ago, the Riga meeting had been pencilled in as the moment when the eurozone could sign off an aid payment for Greece, but in the event ministers vented their frustration with Varoufakis for Greece’s failure to bridge the gap with creditors. Varoufakis said the talks [in Latvia] were “intense”, but remained confident that the two sides will resolve their differences in time. “We agreed that an agreement will be difficult but it will happen and it will happen quickly because that is the only option we have,” he told a press conference. In saying so, he is quite correct. Not only the Greeks, but the Germans too, whose major banks are set to carry the heaviest losses in the event of default, ought to be aware of the extreme dangers of such brinksmanship. A basic instinct for self-preservation is what Varoufakis is relying on, but for so long as the banks and other financial institutions remain confident of receiving further bailouts, it is the German taxpayers who ought to worry – as should the rest of us – because so long as they remain “too big too fail” (i.e., untouchable) then bankers like Mario Draghi and co really have nothing at stake. For once the Greeks are unable to shoulder the debt burden, as Varoufakis reminded us last summer, it will be passed on to the shoulders of the Germans and the French. Indeed, the people of Europe stand to lose enormously if this so-called ‘Grexident’ (in reality ‘Grexpulsion’) leads to ‘Grexit’ and then to ‘Grextagion’ as it will be doubtless be called; as idiotically named as it will have been idiotically contracted and spread. Because, if no compromise can be reached in spite of Varoufakis’ tireless efforts, then sooner then we imagine we may all be standing in the Greek people’s shoes. In a bid to ease tensions with lenders, the Syriza party-led coalition said the minister of international financial relations, Euclid Tsakalotos, would take over the coordination of the new team. The appointment will see the economics professor, who was raised in the UK, assuming a more active role in face-to-face negotiations with creditors. So writes Helena Smith in the Guardian [April 27th], her report released a mere two hours after I posted. But insiders insisted that the politician still enjoyed Tsipras’ confidence, even if the young premier was now reaching out to the German chancellor Angela Merkel in an effort to reach a political solution. With his high popularity ratings at home, Varoufakis is credited with internationalising the country’s debt problem and raising questions over austerity economics. I very much encourage Tsipras to stick by Varoufakis, certainly in the capacity of his chief economic advisor, if not within government itself. We so very seldom see anyone of such intelligence, integrity and courage in public office. The world needs more politicians like Varoufakis, not less. Please note that I corrected this update after mistakenly believing that Varoufakis had stepped down from his role as Greek Finance Minister. Apologies for posting the incorrect original version. All three graphs (and others including those for Ireland and Cyprus) show a marked turning point around 2007–8, providing further evidence not only that “austerity” hasn’t worked (even within its own terms of debt reduction), but that the western world is actually faced with a systemic banking crisis that flared up at that time. The debt-to-GDP ratios have flattened towards the end, but even so the downturn is mostly in the projected regions. Back to the drawing board, our European leaders came up with a deeper haircut in October 2011. They called it PSI Mk2 and even had the foolish Greek PM fall on his sword, to be replaced by a hitherto loyal ECB functionary, so as to ensure that PSI Mk 2 would become Greece’s new light on the hill; a beacon of the last glimmer of hope for a desperate nation. PSI Mk 2 envisaged an impressive sounding 50% reduction in the GGBs’ face value which, in present value terms, would result in a haircut no less than 60% (since the interest rates charged on the new bonds, that would be swapped with the old ones, could not exceed the interest rates charged by the ECB and the EU for the original bailout funds). In other words, holders of GGBs would be hair-cut in two ways: a 50% reduction in face value and an interest rate less than 5% which would cut further into the present value of the old GGBs. And then we have the big problem of growth. Of investment. We have an amazing dearth of investment in Europe, both in the north and in the south. Even in Germany. So what we need is really a Roosevelt-like New Deal – a very large investment programme. I am not talking about a 100 million here and a 100 million there. We need something between 8 and 9% of eurozone GDP to be invested in productive activities… That would be what we need in order to avert deflation and in order to restart growth in Europe. Now we have the European investment Bank in Europe. The European Investment Bank is three times the size of the World Bank. It could very easily effect such a large scale investment-led recovery programme in Europe. The reason why it doesn’t do it, is because the convention is that 50% of every project is funded from a nation state. The nation state is bankrupt. Waive it. And what should we do instead? We should have either the ECB issuing more bonds in order to support the EIB bonds or something simpler than that. Everyone now, including Mr [Mario] Draghi and Mr [Jens] Weidmann [President of German Bundesbank], are speaking about the need for quantitative easing in Europe. Or at least they are considering it. Now we do not want American-style or British-style quantitative easing because this simply inflates bubbles… Mr Draghi’s worried about quantitative easing because he doesn’t know which assets to buy. German assets? Italian, you know, we are going to start arguing like children amongst ourselves, as to whose assets should be purchased. Bu the European Investment Bank issues European bonds, EIB-bonds. Why not have the EIB effect quantitative easing by purchasing EIB-bonds to such an extent that the EIB ca start a New Deal for Europe programme of 8–9% of eurozone GDP with the ECB buying only its bonds, which are European bonds? And also they are triple-A bonds. Now that a combination of those three measures would deal with the banking sector crisis, it would create a rational way of managing the Maastricht compliant and legal part of the debt… and you have a massive investment-led recovery programme. Mr. Mario Draghi has been the President of Executive Board and President of European Central Bank since November 2011. Mr. Draghi served as Governor of Banca d’Italia SpA since December 29, 2005 until November 01, 2011. He served as Managing Director of The Goldman Sachs Group, Inc. until January 2006. He served as Director-general of Italy’s treasury. He served as an Adviser to the Bank of Italy, an Executive Director of the World Bank and as a member of the Group of Seven deputies. He served as the Chairman of Financial Stability Board. He has been a Director at Bank For International Settlements since June 2012. He serves as a Trustee of The Brookings Institution. He has been Member Of Governing Council of European Central bank since January 16, 2006. He served as a Member of Governing Board at Banca d’Italia SpA and served as its Member of General Councils. He served as Member of Board of Governors – Italy of Asian Development Bank until November 2011. He served as Director of Bank For International Settlements from September 2011 to November 01, 2011. Mr. Draghi has a Doctorate in Economics from the Massachusetts Institute of Technology. In current discussions of what Greece might or might not get in the way of concessions from the Eurozone, there has so far been relatively little appreciation of one basic political reality: as far as the governments of Spain, Portugal, Ireland, probably Italy and perhaps even France are concerned, Syriza must fail and must be seen to fail. So begins an article by neo-liberal economic guru Andrew Lilico in Wednesday’s Telegraph. Why? Well, because of the domino effect. Although no debt deal has been reached so far, if the other Eurozone finance ministers were to agree some kind of a compromise and bailout package with Syriza, then it is a near certainty that other European nations, starting with those suffering the worst of the “austerity”, would follow suit. The reasons differ slightly between countries. The easiest case to see is perhaps Spain. In Spain, the governing party is the centre-right Partido Popular led by Mariano Rajoy. It is currently facing pressure from a far-left party, Podemos, allied to Syriza. Indeed the Podemos leader Pablo Iglesias even campaigned in partnership with Syriza and, following Syriza’s victory, at his own party’s rally he proclaimed: “Syriza, Podemos – we will win [venceremos]!” Podemos is currently leading in the polls, ahead of an election later this year. The very last thing Rajoy can afford is for Syriza’s approach to be seen to succeed, emboldening and vindicating Podemos. As for Portugal and Ireland, where the governments stuck to bailout conditions despite the domestic pain, how would they sell concessions to Syriza to their own voters? Suppose they go back and say: “We were suckers. We shouldn’t have made all those cuts. Instead, what we really should have done was to raise the minimum wage, hire back the public sector staff that had been fired, say we weren’t going to pay our debts to our eurozone partners, cosy up to the Russians and tell the Germans they didn’t feel nearly guilty enough about World War Two. Then everyone would have said we were ‘rock stars’ and and [sic] forgiven our debts.” Do you reckon that would go down well? The best way for [Syriza] to fail would be for it to capitulate utterly and crawl back to Greece with its tail between its legs and a few cosmetic patronising “concessions” such as renaming the “Troika” the “Consultative Committee” (or, if it makes them feel better, the “Symvouleftiki Epitropi”). If it won’t do that — and there’s a good chance that if it did try to do that then the Greek government would collapse, anyway — then things get a bit more complicated. Because if it’s bad and dangerous for Syriza to succeed inside the euro, it would be disastrous for it to succeed outside the euro. All these, at least to the mindset of Lilico and his powerful ilk, are “crazy things”. Thus, imposing every kind of tax on wealth becomes, ipso facto, a crazy thing. And as for “print[ing] money to cover public spending”, well printing money to bail out the banks is just fine, of course. That’s called Quantitative Easing which, combined with historically low interest rates (recently turned negative in some places), is all that’s keeping the ever more precarious Ponzi scheme afloat. So don’t be mistaken: what worries Lilico is not the unfettered overproduction of money ‘out of thin air’, but an awful dread that some significant part of this new money might be misdirected “to cover public spending”. Money for public expenditure instead of funnelled into the pockets the bankers (like almost all of the money from the previous ‘Greek bailouts’); to Lilico, this is unthinkable. As for “overthrow[ing] property rights”, well I’m really not sure what Lilico means, but I think the problem might lie in his inherent inability to see beyond a certain characterisation of Syriza. His own hard-right lunacy obscuring the fact that Syriza’s actual demands are both democratic and reasonable. In the end it is the people who matter, and in Greece, the people are suddenly taking to the streets in droves. Not to shout down government injustices, but to add their own chorus of support. Yes, pro-government rallies without a can of tear gas in sight. Can you imagine? Lilico can’t. However, the main trouble still facing the majority of us (the 99 percent) is that evangelists of loopy free-market, neo-liberal economics such as Andrew Lilico have been ruling the roost for decades. Intent only to smooth the way for business as normal, they are already the technocrats and they have a great deal to lose if the system were ever to be radically reformed. Unfortunately, these people are now embedded, and not only within ‘think tanks’ and ‘policy forums’, but also throughout academia, which in itself ensures any dissenting voice – anyone who does not fully subscribe to the current economic orthodoxy – is conveniently sidelined as a heretic. Yanis Varoufakis is a perfect example of just such a heretic. A Professor of Economic Theory at the University of Athens, yet Lilico entirely brushes aside his alternative vision on the grounds that it is “amateurish”. For having cornered the market in supplying economic “expertise”, the likes of Lilico are very handsomely rewarded in their role as ‘consultants’: in reality, one of an increasing number of unelected and unaccountable architects of policy, who pocket a small fortune irrespective of results. Small wonder Lilico fears Syriza’s success. Those wishing to see real political change should get behind Syriza. I suggest that we give those like Lilico good cause to keep on squealing. The European Central Bank is trying to force the new anti-austerity Greek government to its knees. Its actions provoked mass demonstrations in Athens last week in support of the government anti-austerity stance. On Wednesday 11 February the Eurozone Finance Ministers have called an Emergency Meeting with Greece where Prime Minister Alexis Tsipras and Finance Minister Yanis Varoufakis will present their plans. The Greece Solidarity Campaign, Syriza London and other organisations are calling for a Mass Rally in support of the people of Greece on Sunday 15th February at 13.00 in Trafalgar Square. 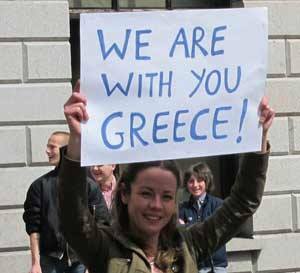 This is part of an international wave of rallies and protests in support of Greece taking place across Europe. Come along with friends and colleagues to show your support for the first anti-austerity government in Europe. On the latest leg of his whistle-stop European tour, Greek Finance Minister, Yanis Varoufakis, today met with his German counterpart, Wolfgang Schäuble, in Berlin to continue talks on Greece’s debt. This was an extraordinary occasion and the press conference that followed their historic meeting can be watched on the video embedded below. This morning – earlier today – I had the opportunity, the pleasure and the joy to outline to Minister Schäuble our government’s priorities for a functioning Greece in a prospering democratic European economic and monetary union. As Doctor Schäuble said, we didn’t reach an agreement, it was never on the cards that we would. We didn’t even agree to disagree from where I’m standing – from where I’m standing we agreed to enter into deliberations as partners with a joint orientation towards a European solution for European problems. A solution that is going to put, first and foremost, the interests of Europe at the helm. We didn’t discuss Greece’s debt schedule for repayments. We didn’t discuss a haircut. We set the scene for deliberations that will lead an approach that will put an end to this never-ending – seemingly never-ending – crisis that began in Greece then unfortunately spread out to the rest of the Eurozone. Greece’s economic woes have been occupying the headlines for far too long. They have been begetting indignity in my nation, and frustration in this country as well as across Europe. It is time to draw a line. To put an end to it. My fellow Greeks wish nothing more than to end the gross indignity, and I’m sure that the people of Germany too would like to get on with concerns other than how to negotiate the latest twists and turns of the Greek saga. Some in Europe are tempted to imagine that the solution lies in separation. Thankfully, today I did not just visit the Finance Minister of Europe’s powerhouse economy, above all else I visited a European statesman for whom European unity is a lifelong project, and whose work and efforts to unify Europe I have been following with great interest since the 1980s. Today my message to Minister Schäuble was that in our government – in this government – he has a potential partner in the search for European solutions to a variety of problems afflicting not only Greece, but the Union more broadly. Starting at home where one ought to start, our government will stop at nothing to combat not only corruption, tax evasion, tax immunity, inefficiency and waste, but also a whole political economy underpinning the ethos and the conventions of crippling rent seeking. In this endeavour, I told the minister, we need our partners’ technical, moral, political and institutional support. Over the last five years, since Greece’s flimsy business model broke down, too much time, and too many hopes, lives even, have tragically been wasted. In 2010, Greece and Europe missed the splendid opportunity to come to terms with the facts. Instead, we treated an insolvency issue as if it were a problem of illiquidity. Therefore, the largest loan in history was granted to the most insolvent of European nations on condition that it shrinks its income. And to sell this grand error to voters in Greece, to voters in this country, in every corner of Europe, a list of reforms was announced that was just a fig leaf for in the end reforming very little that mattered. This could not end well. It is the reason we are here. It is the reason why the Greek people swept over the dominant parties in Greece and elected us. It is why we have been on the road in the last few days deliberating with our partners for the purpose of forging a common and European plan for putting things first – for putting things right. My message to my German counterpart and to the people of Germany is simple. From our government you can expect a frenzy of reasonableness. You can expect proposals that are aimed, not at promoting the interests of the average Greek, but of promoting the interests of the average European: the average German, Slovak, Finn, Spaniard, Italian and so on. You can expect from us an unwavering commitment to telling it as it is, without any tactical stratagems or subterfuge. You can expect from us sound macroeconomic analysis and a readiness to implement efficient microeconomic reforms that work. These are our commitments. We are a government that hasn’t even been sworn in yet. What we request at this stage is perhaps the most precious of commodities: time. A short space of time during which our government can present to our partners, to the International Monetary Fund, to European Central Bank, to the European Commission, comprehensive proposals as well as a roadmap for the very short term – we call this “a bridging programme” – for the medium term, and indeed for the long term. Europe is I believe at a crossroads. Europe must strike a balance between continuity and a need for respecting European agreements, and the necessity of evolving the rules. We must respect established treaties, agreements and processes, without crushing the fragile flower of democracy with a sledgehammer that takes the form of statements such as “elections do not change anything”. When I visited Paris the other day I said that we were returning to one of Greece’s spiritual homes. Today we returned to another one of our spiritual homes. For almost two centuries the land of Goethe, Beethoven, Hegel, Kant has been a source of inspiration to Greeks whether they are rightists, leftists, centrists or simply intellectually curious Greeks. But there is more than that to the bonds binding our nations. As finance minister in a government facing, from day one, emergency circumstances caused by a savage debt deflationary crisis, I feel that the German nation is the one nation in Europe that can understand us better than anyone else. No-one understands better than the people of this land how a severely depressed economy combined with a ritual national humiliation and unending hopelessness can hatch the serpent’s egg within its society. When I return home tonight I shall find myself in a parliament in which the third largest party is not a neo-Nazi party, it is a Nazi party. When our Prime Minister laid the wreath at the iconic memorial site immediately after his swearing in, that was an act of defiance against the resurgence of Nazism. German must and can be proud of the fact that Nazism has been eradicated here. But it is one of history’s most cruel ironies that Nazism is rearing its ugly head in Greece, a country which put up such fine struggle against it. We need the people of German on our side. We need the people of Germany to help us in the struggle against misanthropy. We need our friends in this country to remain steadfast in Europe’s post-war project that is: never again to allow a 1930s-like depression to divide proud European nations. We shall do our duty in this regard, and I am convinced that so will our European partners. Thank you.